Chuck Hitchcock’s passion for the Santa Fe Railway began when he was young, and endured over the years until he had the perfect basement setup to build his own HO scale layout of this historic railroad. 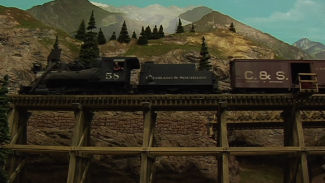 Chuck’s freelanced Argentine Division of the Santa Fe stands to this day as one of the most innovative models ever built for its pioneering use of urban scenery on an industrial railway, as well as the way Chuck utilized staging yards to organize such a high-traffic system. 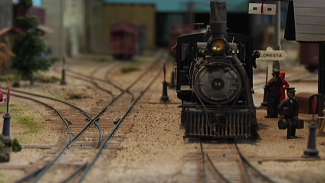 In this segment, host Allen Keller visited this marvelous HO scale layout and sat down with Chuck to hear his story for the making of the Argentine Division, including the inspiration and design techniques that went into planning and building the HO scale layout of these invaluable Kansas City rails. As with all of the world’s great model railroads, many years of thought and planning have gone into the construction of Chuck’s HO scale layout of the Santa Fe. The idea began at a junction in Holliday, Kansas, where Chuck used to sit and watch the trains roll by in rapid succession, meeting at the connecting points between Santa Fe Railway and others. Chuck talks about how the concept for his largely freelanced HO scale layout grew in his mind, and thus he began to plan an HO scale layout with a high density of traffic and many trains on the tracks at once. This large amount of activity would require organized staging yards at either end of the model, which he would eventually add to his HO scale layout by way of Kansas City and Ottawa City. In addition to the inspiration and trackage considerations of his HO scale layout, Chuck talks about some of the thought process behind the landscape scenery he designed for the Argentine Division. The rolling hills and river valleys of Kansas may have been difficult to recreate, but Chuck was up to the challenge, thanks to some photographs of the region and a creative vision. See what else lies in store on this magnificent HO scale layout created by one of the masters of the hobby!